A new informational campaign and online portal launched Monday shows that the U.S. dairy industry creates nearly 3 million U.S. jobs, has an overall economic impact of more than $628 billion and accounts for more than 1 percent of the country's Gross Domestic Product (GDP). At a kickoff news conference, the U.S. Dairy Export Council (USDEC), the International Dairy Foods Association (IDFA) and the National Milk Producers Federation (NMPF) emphasized research data as they unveiled their “Got Jobs? campaign. The joint effort features a logo reminiscent of the iconic "Got Milk?" ads, but with a different message: "Dairy creates jobs, exports create more." A new GotDairyJobs.org portal showcases hard facts and real faces of real people working real jobs, thanks to dairy. The resources are intended to help the dairy industry, news media and others tell the dairy economic impact story that is playing out nationally and in virtually every state. 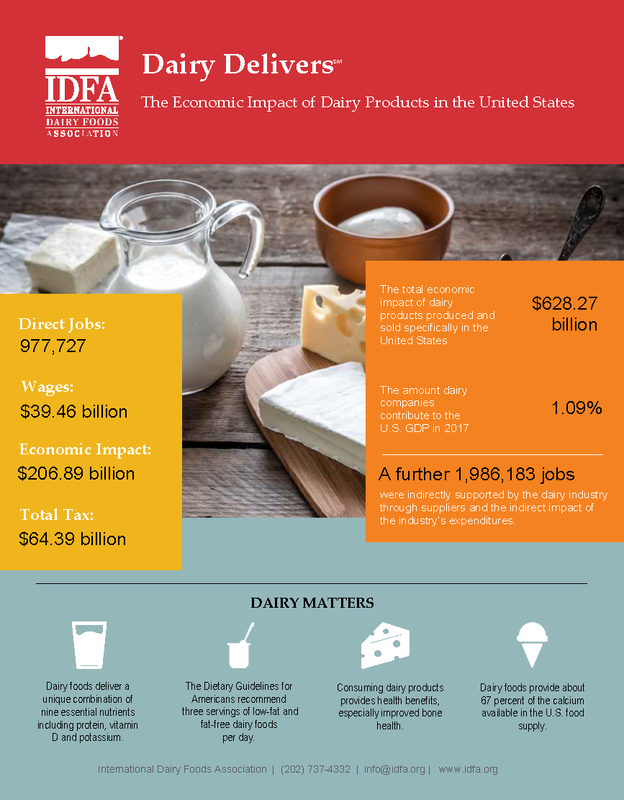 The source for much of the data comes from Dairy Delivers℠, IDFA's economic impact tool. The new portal enables users to quickly find state-by-state fact sheets showing economic impact and exports. One-page fact sheets featuring state-by-state data—as well as national data (shown below)—are available to download in just one click. More than 20 journalists attending the virtual news conference were told that over the next year, the site will offer monthly features, videos and hard facts that demonstrate dairy’s continued impact on jobs, tax revenue and communities around the country. At the kickoff news conference on Monday, USDEC President and CEO Tom Vilsack described the importance of tax revenue provided by dairy industry to state and local governments across the country, including those in Iowa where he formerly served as governor. 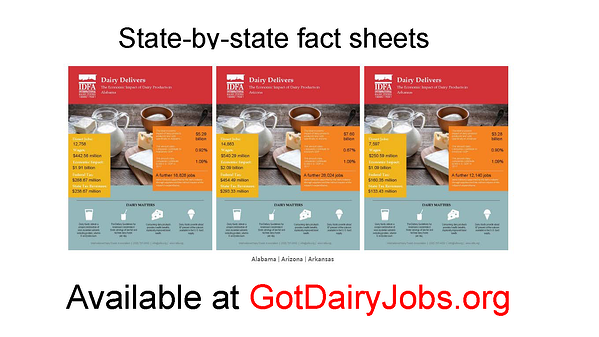 Using #GotDairyJobs, the dairy industry supplies social media resources on the site (at "Share the Story") that will amplify the campaign and create a dairy jobs conversation on Twitter, Facebook and Instagram. 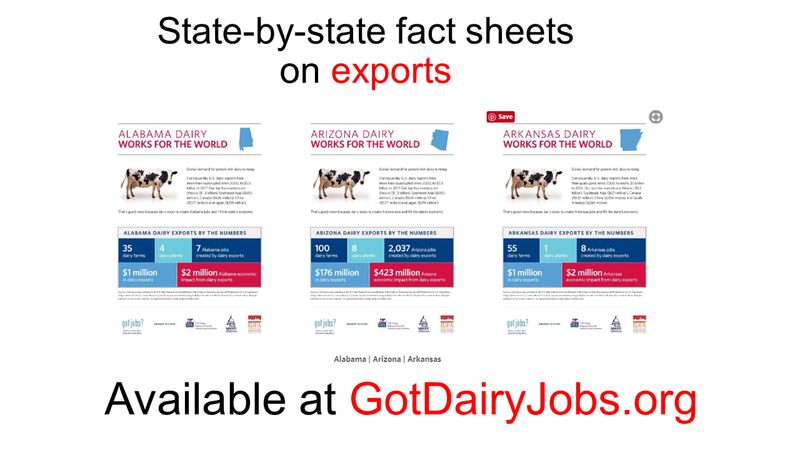 State-by-state fact sheets focusing on export data are also downloadable with one click. Michael Dykes, D.V.M., president and CEO of IDFA, said the potential for increasing exports relies on a level playing field with global competitors. "Backed by fair and proactive trade policies, the U.S. dairy industry will continue to keep and create jobs in states across the country,” said Dykes. The video below shows national job-creation information by the numbers. The campaign plans to focus on top job-generating dairy states, one per month, over the next year with similar videos, as well as human-interest stories and other content. For questions and ideas on how your organization can participate in the campaign, contact Mark O'Keefe at mokeefe@usdec.org. Farming Dairy Trends Got Jobs?